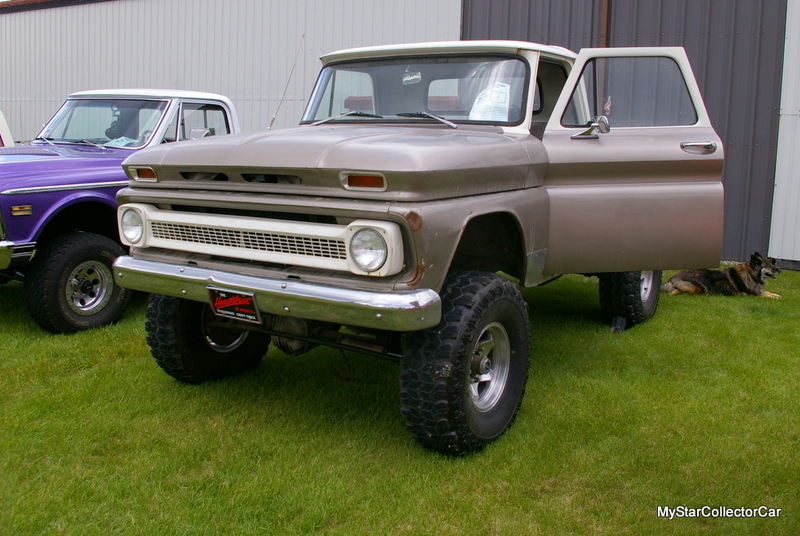 The 1965 Chevy trucks were a stylish addition to the domestic pickup world of the mid-60s. 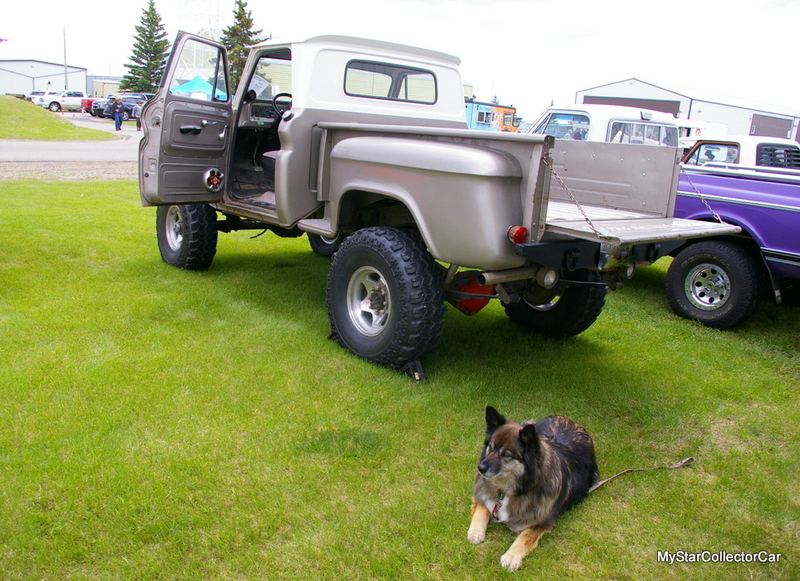 The trucks were purpose-built to handle hard work and did not disappoint their owners. 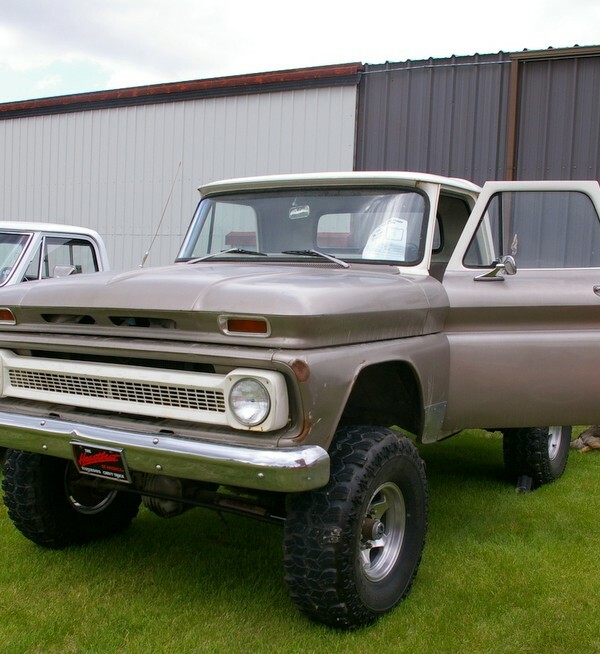 A 1965 Chevy K-10 was even more versatile than other trucks from its era because it was a 4-wheel drive vehicle and could go places where two wheel drive truck owners feared to go in ’65. The “K” part of the model equation showed the truck was a 4×4 and the “10” part of the model name meant it was a ½ ton in GM’s world. 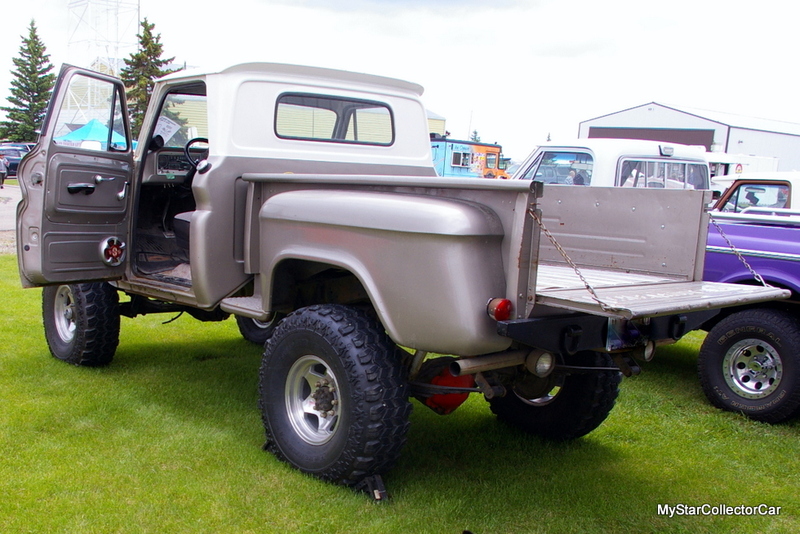 The four-wheel drive versions of any truck from the past meant they were taller than a two-wheel drive version because they had to clear the uneven terrain found off the road and in the bush. 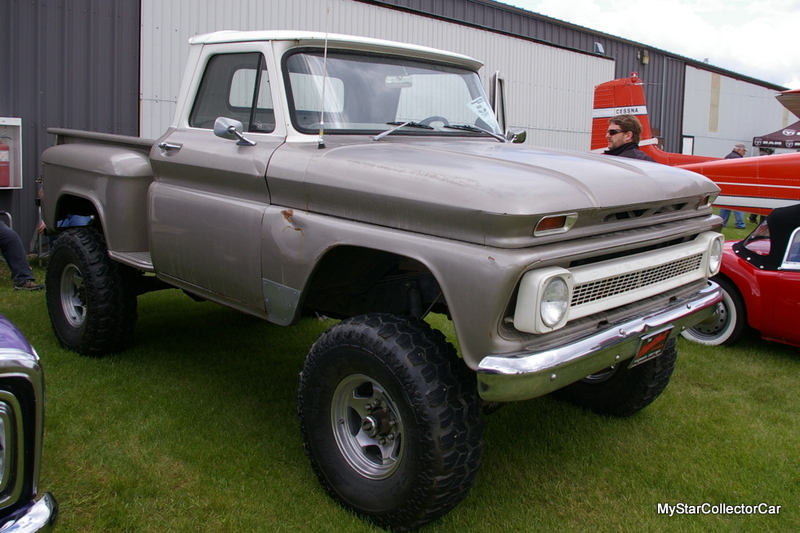 A 1965 Chevy K-10 was even taller than a stock version of the same truck. Owners Ken and Sharlene Lafferty both had personal family connections to a 1965 Chevy truck in their pasts. Ken’s grandfather owned a ’65 Chevy pickup– and so did Sharlene’s father. Both men’s trucks were used for hard work and left a big impression on the husband and wife when the Ken and Sharlene were young kids. Therefore the hunt for a vintage Chevy truck began and ended with a 1965 version for both Ken and Sharlene for sentimental reasons. The search ended about 5 years ago when they found their ’65 Chevy K-10 just north of Spokane, Washington and brought it back to their Alberta, Canada home. 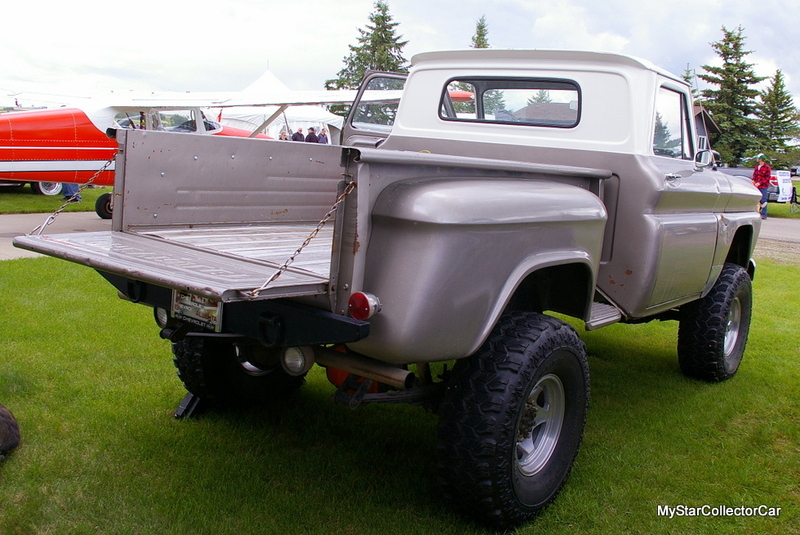 The 53-year-old truck was not exactly stock and is actually taller than a stock version of the same truck model. The ‘65 Chevy pickup now rides on a 1976 Chevy frame that was installed by the second owner, along with some significant ride height enhancements that have given the truck a lofty perch. The new height and giant tires have given the ’65 Chevy 4×4 some serious eyeball appeal for younger onlookers but Ken has a different vision for the truck. He would like to drop the truck back to its original ride height in the future because the extra height is a “little too out there”, in Ken’s opinion. 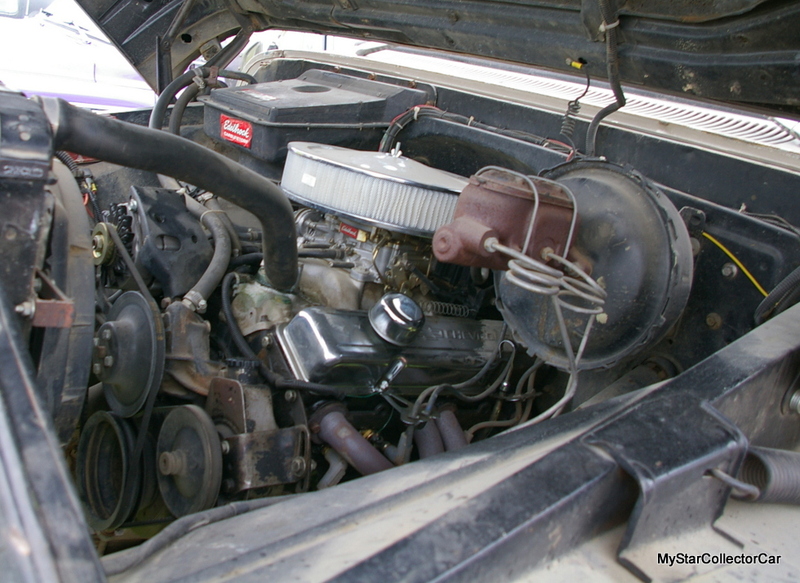 The truck has a crate 350 small block that delivers plenty of horsepower but the low gears (“Granny gears” in Ken’s words) in the truck work against the extra horsepower in a big way, so Ken is only able to coax about 40-45 MPH out of the 4×4. 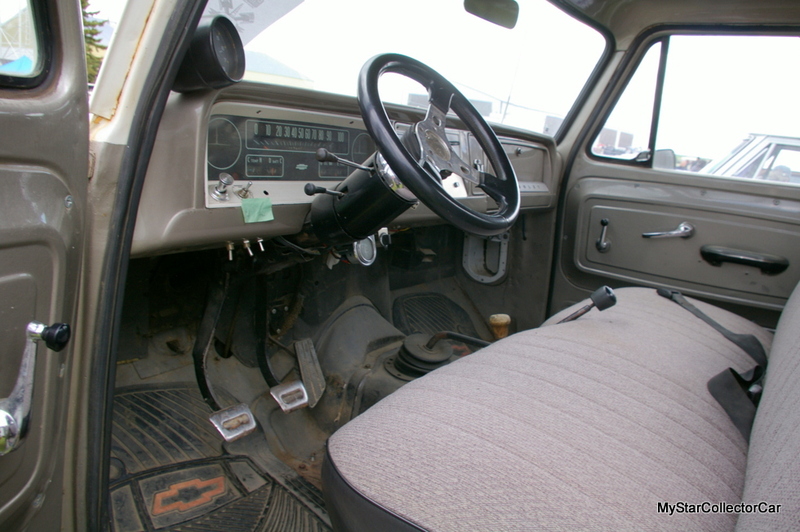 The truck also has a number of upgrades that include power brakes, power steering, headers, and an electric fan. Nevertheless, Ken also mentioned the truck “rides like a lumber wagon” with its current suspension and also wants to improve this aspect of their Chevy pickup. Ken and Sharlene have many future plans for their Chevy truck and will base their decisions on Ken’s post-retirement plans to make the truck into a regular driver. The two of them have plenty of time to formulate their plans and will proceed with caution along the way. Right now they just plan to enjoy their truck and think about the sentimental reasons behind its purchase.